It really seemed to be him, but strangely I have never heard about this. A rapid search on the IGI gave me exact dates for his children’s baptisms, and the town was matching, then I read that Mariana and her family were in Pisa in the winter of 1794. It was him indeed. I thought I really had made a discovery! A few moments later I tried to look him up in the Ingamell’s dictionary and found him under his daughter’s entry. 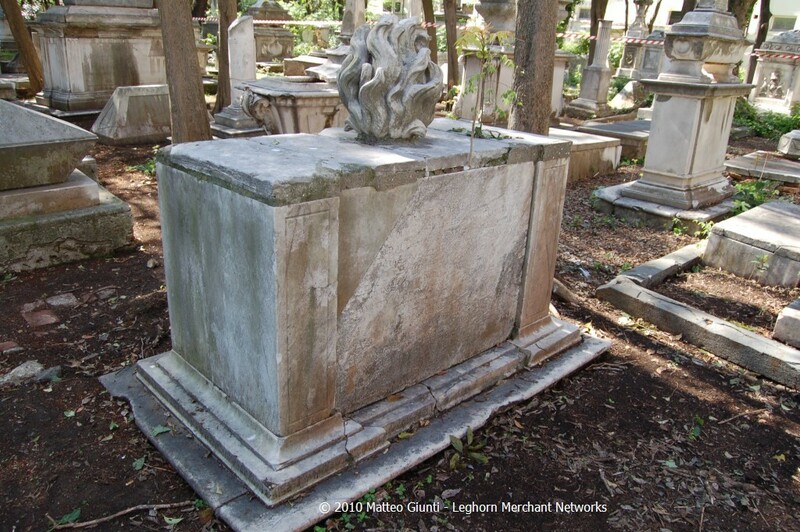 Ingamells was aware that he had been buried in Livorno but how is it that the book on the Inscriptions of the cemetery just transcribes his inscription without even a small note about him ? Quite odd. Another search led me to find a book in italian by Prof. Mario Curreli: “Scrittori inglesi a Pisa”, edited by ETS in 2005. 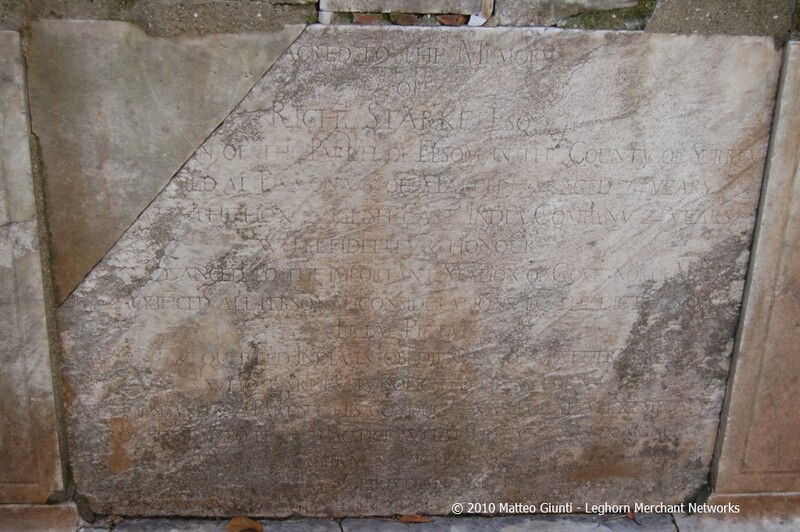 He reports the presence of Mariana and her family in Pisa in that year and also her father’s death in March 1794, followed by his burial in Livorno. Ok, very good, it’s not really a discovery… but still this seems to be quite unknown to the general public, so I decided to publish my finding here, admitting my childish enthusiasm ! Richard STARKE was born about 1720 and married Mary HUGHES at Banstead, Surrey, on June 30th, 1759. Their children were baptised in Epsom, Surrey between 1760 and 1772. His daughter Mariana was baptised on Saturday October 23rd, 1762. 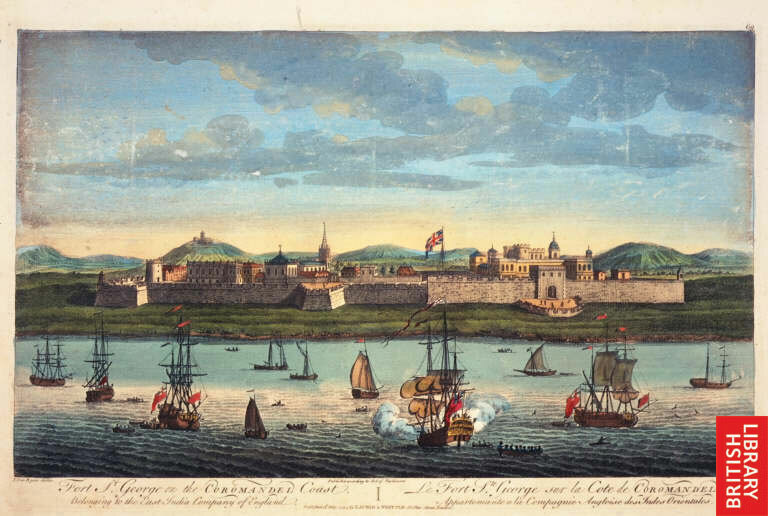 Mariana’s biographers tell us that she grew up in India, where her father served as Governor of the British EIC’s post at Fort St. George in Madras. He worked for the EIC during 24 years and he probably entered first as a writer, some sources indicate around 1735, becoming Deputy Governor in 1750 until 1752. I didn’t find any information at the moment for the period 1752-1792 when all the family came to Italy for a Grand Tour and for the health problems of a close relative (the mother?). He died at Pisa on March 5th, 1794 and was buried on the 9th, no other note exists on the Chapel Register #2. His will is under examination. Recently, thanks to the inputs of a researcher, Mr. Brian Bouchard, I have conducted further research on the family of Richard Starke and found other interesting information and corrections. I’ll publish an update soon.